The Index opened positive and stayed positive throughout the entire session of trade and closed near the highs at 8373.65, huge gain of 111.30 points. The broader market was positive, with 990 advances to 485 declines. Developing Range has increased as per Option Table to 8100-8800. 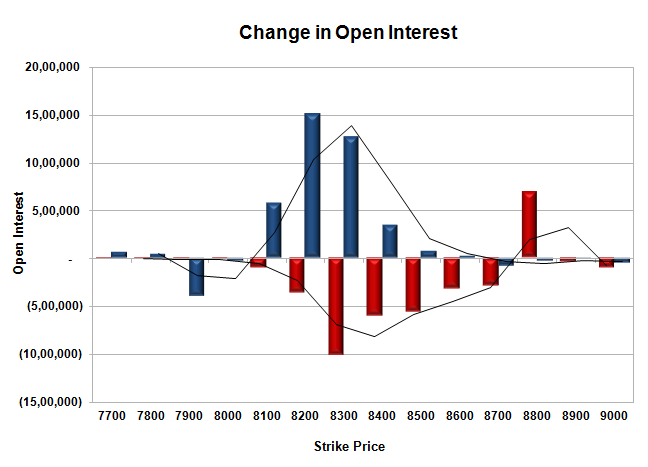 Call option 8800 added 6.88 lacs OI with short covering seen at 8400 and below strike prices. Put option 8400-8100 added huge 37.03 lacs OI with profit booking seen at 8000 and below strike prices. 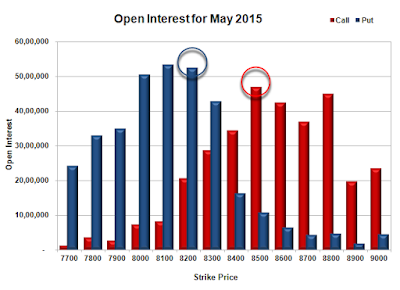 Nifty Open Interest is at 1,36,24,125 down by 3,85,900, with increase in price, most probably huge short covering. 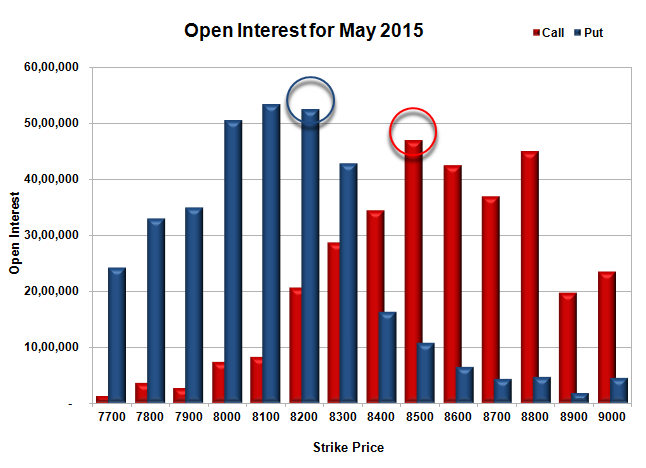 Bank Nifty Open Interest is at 17,60,325 up by 1,33,100, with increase in price, most probably huge long build-up. FII’s bought 1.41 lacs Futures, which includes 1271 contracts long liquidation and 6930 contracts short covering, with decrease in net OI by 8201 contracts (includes 64818 longs to 59159 shorts for the day) and the Average Price comes to 9032.84. FII’s Index future open contract as on date is 220419 Longs to 277414 Shorts, Net Short 56995 contracts. Initial support now at 8300, with OI of 42.76 lacs and below that at 8200 with OI of 52.41 lacs. 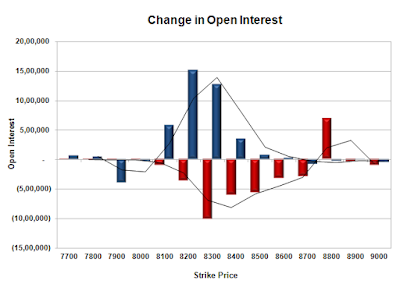 Initial resistance though looking weak is at 8400, with OI of 34.36 lacs and above that at 8500 with OI of 46.96 lacs. 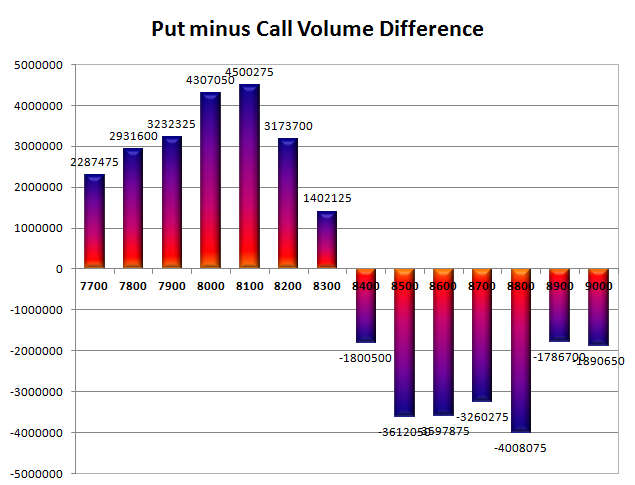 Day Range as per Option Table is 8255 - 8446 and as per VIX is 8295 - 8452 with 8343 as the Pivot.